Í am a carer. Use it to wash my client, cook, etc. 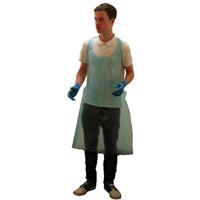 The aprons are of a good quality for the purpose we will be using them, use once and discard.. I use the product when I empty my husbands commode. The quality is first class. I would recommend them to any one who is in a similar situation. Excellent and easy to carry with you.